Dreaming of a stay in the Drôme with total peace of mind? At the Yelloh! 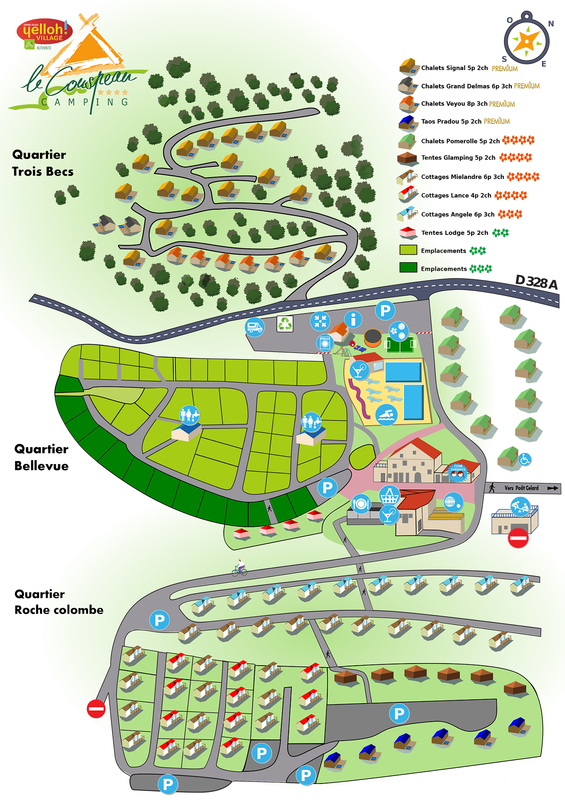 Village Le Couspeau, we make everyday life simpler for you with the various facilities we have on-site. At the camping Le Couspeau, the welcome and service we provide are our chief concerns. To make sure we get them right, a concierge service is fully devoted to you! Borrowing and hiring equipment, information about the region, a postal service and plenty more! We will be able to make your holidays nicer than ever! And as it is our wish to simplify your stay for you, there's a grocer's for you within the campsite itself! Basic household items, bread and even a newsagent: there's no doubt about it, your holidays will never have been so practical before! The campsite has TESLA charging points. If you would like to enjoy a meal, you don't even need to leave the campsite. Our bar and restaurant are here for you to soak up a really pleasant atmosphere, and are ready to meet all your requirements! Fancy a quick lunch? A meal with the family? Spend your time just as you see fit at the camping Le Couspeau!